On the second floor of the Reeves, past the birds and the biology labs, is USU Eastern’s greenhouse. Although unsure of its age, Assistant Professor of Biology, Wayne Hatch has been tending to the garden for the past three years. He first learned of its existence at the beginning of his employment at Eastern. He and other professors took care of the garden, but for a time the duty was Dr. Hatch’s alone. “I don’t do much, just clean up every once in a while and water when the plants need to be watered.” Hatch says. With no set schedule, he tries to visit the greenhouse at least once a day to keep an eye on the plants. Occasionally, students will assist with up keep. Not just college students, but high school students as well. They come to visit every now and then, potting new plants or transferring growing plants, as well as watering and pruning. The greenhouse consists of two rooms. When entering, the first room is intended to be humid for plants in need of moist climates. Past this room is a second smaller space with a dry environment. This space houses cacti and other plants one would find in the desert or drier weather. Recently another figure on campus has taken notice of the greenhouse and has been using it for his community garden. Vice Chancellor and Provost Gary Straquadine discovered the greenhouse nearly a year and a half ago. Have you noticed the seasonal veggie garden located behind the Center for Workforce Development office? He planted community gardens in every institution he has worked. He used to outsource all his seedlings, but since he stumbled upon the greenhouse, he has grown all the plants himself. You can find Straquadine in the greenhouse at least once a day watering his seedlings and moving them around so they get different exposure to light. “It’s more of a growth chamber than a greenhouse,” say Straquadine. The conditions aren’t ideal, given its indoor placement. If he were to use any kind of pesticides, the whole second floor would suffer. However, the location is optimal for incorporating the greenhouse into school programing for the college, the high school, and the Boy and Girls Club. Straquadine hopes to build a bigger outdoor greenhouse with temperature control. “USU Eastern is a very open community to my crazy ideas.” They have been kind to him and he feels at home here. 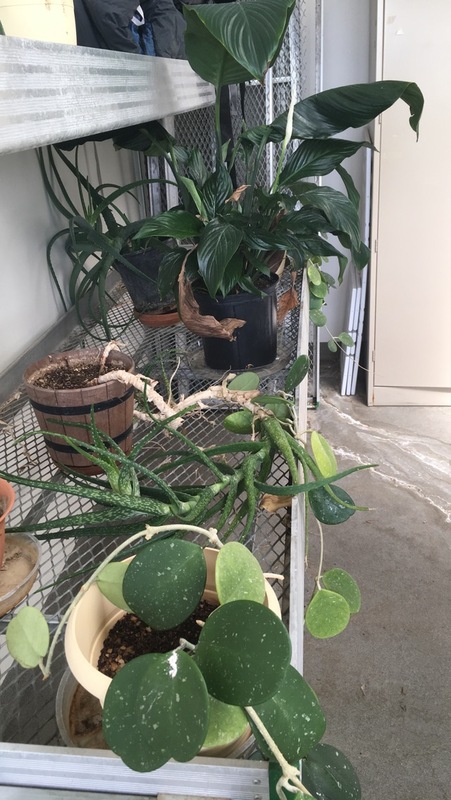 For now, the greenhouse in the Reeves remains the primary source of plant growth on campus.